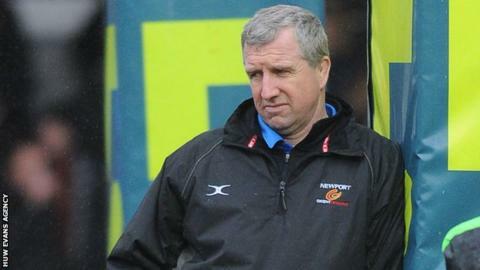 Newport Gwent Dragons Director of Rugby Lyn Jones says Welsh rugby's £60m peace deal has come "10 months too late" for the regions to strengthen. The Welsh Rugby Union and four regions signed a six-year agreement in August to end nearly two years of a fraught dispute over funding. But Jones says it comes too late for Welsh sides to compete financially with the teams at the top of the Pro12. "It's about 10 months too late to have an influence on this season," he said. "A lot of Welsh sides will just drag their heels again. "One thing I've learned is to not be afraid to give young players an opportunity because you'll be surprised how good they can play. ""As long as we concentrate on our game the result will look after itself." "Hopefully we can utilise the next twelve months to try and…get our academy right up to be the best in Wales. "It's about strengthening when we can." The agreement means the regions will all receive a shared £2m increase in overall funding, to £8.7m, from the union as well as a one-off payment of £500,000. The Dragons have made a number of signings this summer, including South African prop Brok Harris and Welsh internationals Lee Byrne,Aled Brew and Andy Powell. But they have been left short at centre after injuries to Ross Wardle, Ashley Smith and Pat Leach. Jack Dixon, 19, and Tyler Morgan, 18, are likely to start the Pro12 opener against Connacht on Saturday. Leach damaged his knee in the pre-season friendly victory against Northampton on Friday and is currently being assessed to determine the extent of the injury. Smith is due back in mid-September after undergoing foot surgery, but Wardle is out until the end of the year with a knee injury. "It's tough...we're quite short [at centre]," said Jones. "[But] one thing I've learned is to not be afraid to give young players an opportunity because you'll be surprised how good they can play." The Dragons have not won at Connacht in the pro12 since their 32-14 triumph in May 2004. Jones is expecting another tough encounter. "Connacht have always been a very difficult side to play against," he said. "They're very effective and efficient in what they do. "We are going out there with no preconceived ideas. "We are focused on our own performance and what we can do and what we can offer the game. "As long as we concentrate on our game the result will look after itself." Who is Pro12's biggest bosher? Read more on Scrum V: Pro12's biggest bosher, best stepper and imposing venue?